Help out with default covers! 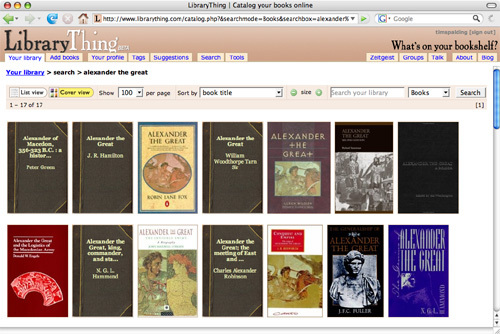 LibraryThing now shows a special blank cover whenever a book lacks one. We think we can do it better. We’d love members to be able to pick a different cover, and even different default covers for different books. For example, I’d love to have a default cover for the Loeb Classical Library’s Latin (red) and Greek (green) books. So, let’s open it up. LibraryThing members have time and again shown they take better pictures than us. So let’s have a contest! UPDATE: Two people sent in some very slick covers, in a rainbow of colors. I think they’re pretty cool. Check them out below. I also set up a wiki page for the contest. What do to: Take a photo of your favorite, probably old book. Make sure you take it from directly above and the image is clear. The image. Quality is key. The image need to be large and clear. You don’t need to Photoshop it yourself—slicing it out of background and removing the title, if there is one—but it has to be doable. Shadows are killer. The rules. We’ll give out three-to-five free accounts, but we reserve the right to use any image submitted. All images will be credited on the page where you choose them, if you want it.